CREDO assists with preliminary research by searching in hundreds of reliable encyclopedias, dictionaries, thesauruses, quotation databases, and subject-specific reference monograph titles, as well as over 200,000 images and audio files and nearly 100 videos. You can also browse by concept. CQ Press Library is used to search or browse for professionally compiled resources on topics relating to the U.S. government, current affairs, history, politics, and public policy. Be a critical thinker; compare and contrast multiple sources to obtain a balanced perspective, and know the validity of your sources. The following tools will help you uncover fake news. "Alternative facts" is simply a euphemism for misinformation and lies. 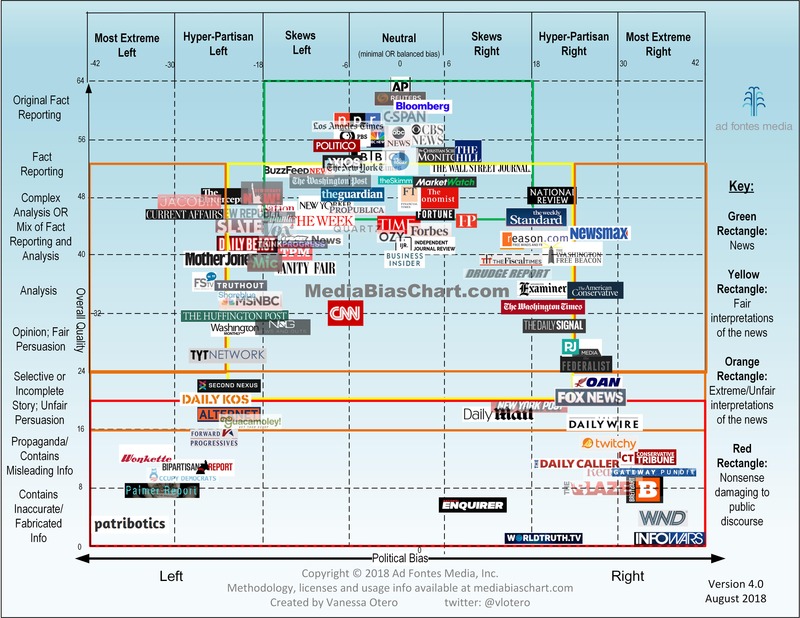 Infographic about where along the Liberal-Conservative continuum various news sources are found. Who Lies More chart of politicians. Alternative chart representation. Facts about recent gun violence in the United States. The toilet paper over/under debate...not solved even with the patent image. Neil deGrasse Tyson speaks about the validity of science. Fact checking by NY Times of the Trump 2019 State of the Union speech. Mike Caulfield. Web literacy for student fact checkers...and other people who care about facts. Self-published. People are lazy in using critical thinking to find an accurate perspective. Today in History - see important events that occurred on this date. Opposing Viewpoints creates articles and topic overviews, and gathers primary-source documents, statistics, images, and podcasts on current social issues. It also has national and state curriculum standards. This tool provides a good introduction to topics, but you should supplement it with related in-depth materials from our other databases. Wikipedia provides crowdsourced information on many topics ... which can be a good source of common knowledge ... but one must be very careful to critiique the accuracy and reliability of such information. The other resources listed on this page have certified authority and accuracy. The Wolfram Alpha search engine is primarily used to gather statistical or factual data. Example sections also provide overviews of disciplines ... with data and explanations of the underlying equations, principles, and conditions. The Statistics page provides many resources for discovering data on the Internet, some from government agencies, some from international agencies, and data from other sources. In many cases these data sets must be imported (in some cases after format manipulation) into data tools such as SPSS and SAS. For additional information about Data support, see the Purdue University Data site. The library also provides access to the SimplyAnalytics tool that allows researchers to mine U.S. census data and sets of business data in order to generate maps or build data sets that can be exported into other tools such as Excel, SPSS, and SAS for further manipulation. See our short videos showing mapping and ranking by a variable and finding various data sets.